Our conference agenda is packed with inspirational key note speakers, innovators, and experts. At the EXPO you can experience live demos and meet companies representing every aspect of the Wi-Fi industry. Wi-Fi NOW is the perfect place to drive your Wi-Fi business forward. 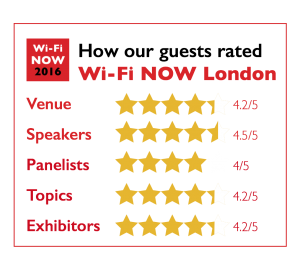 If your company operates in the Wi-Fi industry, Wi-Fi NOW is the one event you won’t want to miss. CEO of Wi-Fi NOW Claus Hetting has managed and directed ten major Wi-Fi industry events in Europe, USA, and Africa. Wi-Fi NOW Africa builds on the successes of our previous events in London, Washington DC, and Amsterdam that have included more than one thousand delegates as well as more than 100 sponsors and exhibitors.